How fast they can build is all about repetition, ruthless repetition – just like we learnt as children with meccano and lego pieces. This project recorded 3 floors per day…. 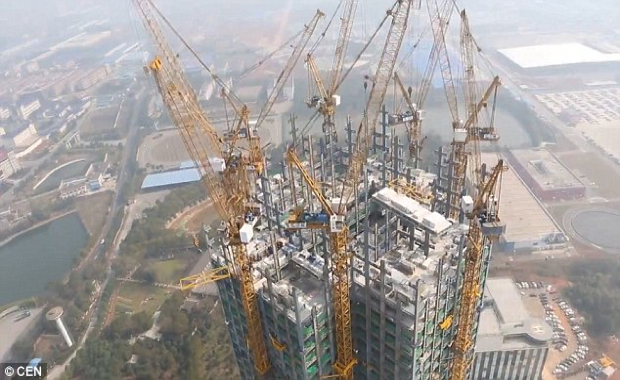 “A Chinese company has recently built a 57-storey, 800 apartment skyscraper in just 19 working days. While Mini Sky City is certainly not China’s tallest or flashiest skyscraper by any means, the startling speed at which it was built is amazing. 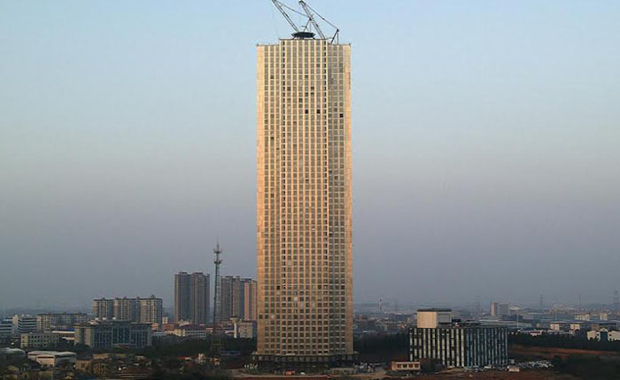 The builders, Broad Sustainable Building were able to get Mini Sky City ready so quickly for occupants in the Chinese city of Changsha by assembling the skyscraper out of pre-fabricated sections. According to the firm’s vice-president Xiao Changgeng, three floors were assembled each day using a modular method. Speaking to The Guardian, Mr Changgeng said Broad Sustainable spent four and a half months fabricating the building’s 2,736 modules before construction began. “This is definitely the fastest speed in our industry,” Mr Changgeng said. The skyscraper has 19 atriums, 800 apartments and office space for 4,000 people, with space in the building going on sale late last month. Barely completed, the developers are already looking to better and bigger things. That being the challenge to build a 220-storey building in only three months. In an interview with the BBC, Chairman of the Broad Group (parent company of Broad Sustainable) Zhang Yue says he wants to drop the ‘mini’ and use the same technique to build the world’s tallest skyscraper, Sky City. Chairman Zhang says his proposed building should only take seven months from start to finish – four for the foundations and three for the tower itself. While the building is yet to be built, Zhang says it will be constructed just like Mini Sky City and the 30 other buildings his company has completed including a 15-storey hotel in six days and a 30-storey hotel in 15 days. The process begins with steel being delivered to one of Broad Group’s six factories, where it is machine cut and welded into one of a few basic modules – a column, crossbeam or floor section. The modules are then transported onto site where they are bolted and welded together. The company says 90% of their buildings’ components are prefabricated, with only the interior finishings needed onsite. After the success of Mini Sky City Zhang believes a revolution is coming, and the revolution will be “modular, steel, and all green”.